Side by Side Bear Mountain and Snow Summit offer shredders enough terrain, to make visits to Bear Mountain Resorts, worth the drive from Los Angeles. "Bear Mountain Resorts" refers to both ski resorts as one since the lift ticket can be shared. Bear Mountain is the bigger terrain park with over 200 acres of winter fun, with 80 different runs just for riders from beginner to advanced. The "Superpipe" is super in size and the grooomers do a fantastic job with over 150 different rails, jibs, boxes and challenges for our riders. Bear Mountain is more snowboard oriented than Snow Summit which is more "mixed use" with skiers and snowboards, but skiers and riders are welcome at both Big Bear Lake ski resorts. Longest run at Snow Summit, 1.25 miles, it is lit up at night for nighttime riding and skiing. 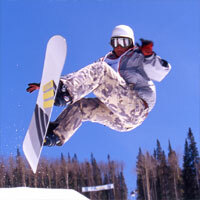 Snow Summit Snowboard Terrain Park Westridge freestyle terrain park is over 6,000 ft long. It includes world famous Zzyzx halfpipe and park. Ego trip fun park has space enough for your twin tips and riders, and Fun Zone is for families and first time riders who want to learn how to take those jibs and jumps. Westridge is lit for night skiing.